If you're significantly overweight, want to make a lifestyle change, but are looking for a non-surgical, minimally invasive procedure, Intragastric Balloon is the right step forward for you.It is a 12-month weight loss program designed to kick-start your weight loss while supporting your lifestyle changes. The Instagastric balloon devices (It’s not a surgery), are for use in obese adult patients with a body mass index between 30 and 40 with 2 obesity-related health conditions like heart disease or diabetes. It doesn’t require that you necessarily qualify as morbidly obese (BMI >= 40). In fact, the gastric balloon procedure is perfect for anyone who needs to lose up to 25 kg (55 pounds) too. 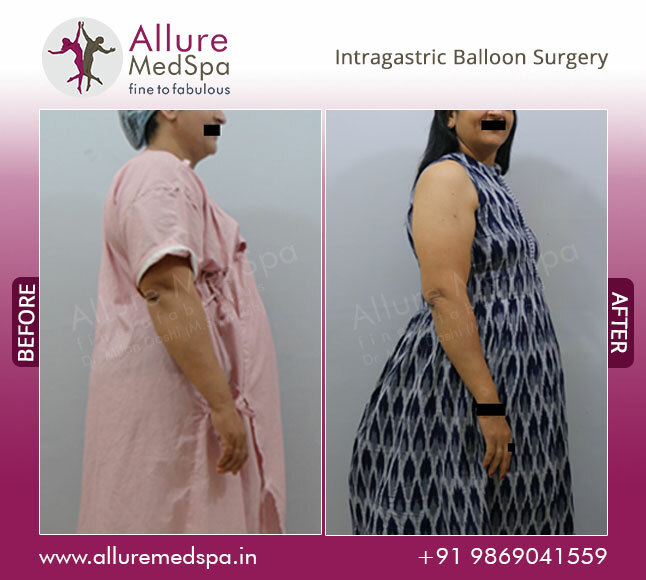 The Intragastric Balloon is also sometimes recommended for morbidly obese people who plan to have a surgical procedure later on, but who need to slim down a bit in order to improve other conditions that will make the surgery possible. The Intragastric balloon is a non-surgical weight loss procedure which helps to reduce your appetitie, and over a 6 months period your body will adapt a new dietary programme. It was developed to “bridge the gap” between pure diet and exercise and the other, more complicated, weight loss surgeries. Because there is no cutting or removing of tissue, the risk of surgical complications such as bleeding and infection is greatly reduced. The Intragastric balloon is a soft, silicone sack inserted into the stomach and filled with saline. You will have a feeling of satiety, or lack of hunger which will help you learn to moderate your food intake so that you eat less and lose weight without surgery. The minor procedure, takes around 20-30 minutes and is carried out under a local anaesthetic. The deflated balloon is inserted into the mouth, then as soon as it is in the correct position the surgeon will then insert the sterile saline which then inflates the balloon, occupying space in the stomach. 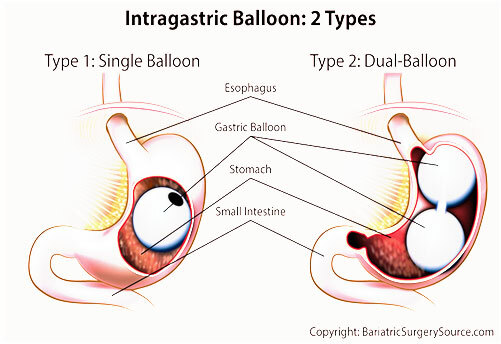 Once the balloon is in place in your stomach it is filled with saline, expanding to partially fill the stomach area. This helps you feel less hungry and consume smaller portions of food as you experience a similar satisfaction as you would have previously experienced after consuming a larger meal. 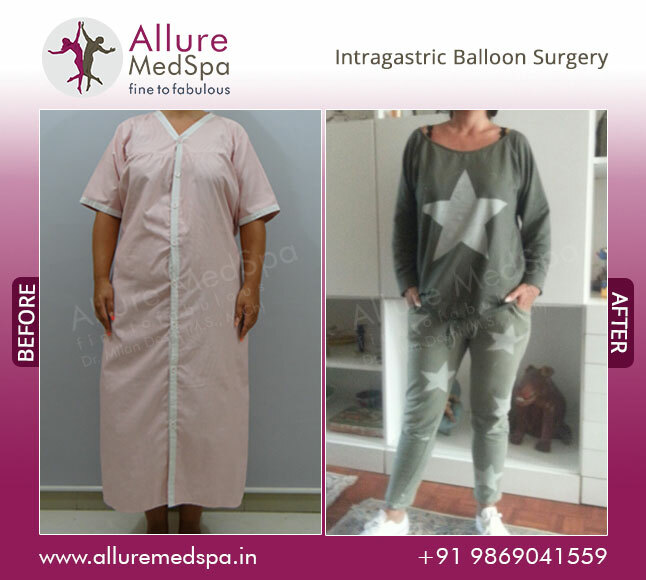 We at Allure MedSpa have a proven track record of success with Intragastric Balloon Procedure. Success with intragastric balloon placement is also dependent on participation in the nutritional and exercise programs that are an important component of our Comprehensive Balloon Therapy program. Apart from our Lead surgeon Dr. Milan Doshi, you will be meeting all members of our team, including our interventional endoscopist who performs the procedure, as well as specialists in nutrition and exercise management. During the first six months (and after) you will work together with our nutritional support team and weight loss experts to personalize your own plan. The procedure is carried out under a local anaesthetic. It usually begins with your throat being numbed by a spray. The Intragastric Balloon System is implanted in the stomach via a 30-minute minimally invasive endoscopic outpatient procedure while the patient is under mild sedation. The typical gastric balloon patient returns home on the same day. It is recommended that you have someone who is willing and able to drive you home and take care of you for at least 24 hours following surgery. Also, plan about 3 days of inactivity for full recovery. Your throat will probably be mildly sore following the procedure since the balloon was inserted through your mouth. Intragastric Ballooning is a laparoscopic procedure that can be performed on an outpatient basis. 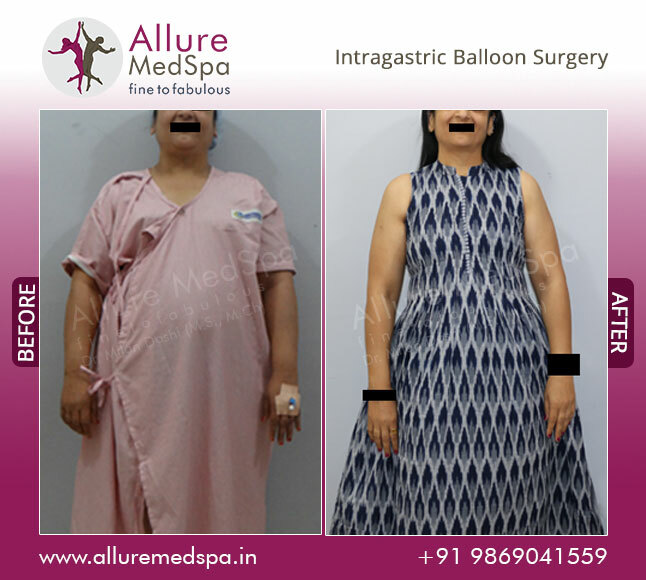 Allure MedSpa which is renowned for its state-of-the-art internationally acclaimed services, offers affordable and cost effective bariatric procedures. To know more about the cost of your Intragastric Balloon Surgery procedure request a consult by filling the form below. Your consultation is your chance to ask questions about Intragastric Balloon Surgery and put your mind at rest. Your surgeon will be able to offer you full explanations and answers to all of your queries. After the birth of my first child, I started putting on a lot of weight. I immediately joined a gym and started dieting too, but the weight was not going down. To my utter dismay, even after 3 months of dieting and exercise, the weight still remained the same. One day, while working at my office, I happened to chance upon the Allure Medspa website. I went through the articles at the website and thought of calling to enquire about the weight loss procedure. I called the clinic and came to know about the various weight loss surgeries. The staff arranged for a consultation with Dr. Milan Doshi. His choice of words and his friendly nature gave me the confidence to go ahead with the surgery. They asked me to put forward a mail along with some photographs where I want to undergo the surgery. My problem area is my tummy. It has bulged out over the years. I am just not able to wear normal clothes. In a week\'s time they fixed for a Intragastric balloon surgery and gave me the quotation for the cost and everything. I found the prices quite affordable and made the tickets to visit India for the surgery. The surgery took an hour and the process uses a balloon that is being inserted in the stomach. There is no risk involved with the surgery. The surgeon even asked me to follow proper diet and light exercise after the surgery is done. Slowly, I started losing the extra weight and in a course of six months I almost toned down. After a period of six months , I paid a visit again to Dr. Doshi to remove the balloon that is being inserted. I must admit I am very happy with the result. I no longer have to worry about wearing my favorite clothes now. Yes, if you are moderately overweight and unable to achieve your desired weight loss through traditional weight loss methods, such as diet and exercise. Yes, if you are only aiming at losing about 20-30lbs and are not eligible for, or maybe uncomfortable with, other forms of weight loss surgery. Yes, if you have a BMI of ≥ 27 and are willing to participate in an established medically-supervised diet and behavior modification program with regular follow-up. At the end of these Dr. Milan Doshi will himself review your specific health issues and concerns, answer any questions you may have and set a date for surgery. Our dedicated team of Doctors, Nutritionists and Cosmetologists is designed with your comfort and care in mind. Our entire staff from to the expert team of anesthesiologists to nurses, will ensure you are treated with utmost care and warmth. In addition to a complete medical history, your physician and anesthetist will perform a complete physical examination to ensure you are in good health before undergoing the procedure. You will undergo blood tests or other diagnostic tests. No matter what your weight goal, the Intragastric balloon will help you. It is an ideal solution if you are looking to lose up to 20-30lbs of excess weight, but don't want to undergo permanent surgical solutions. Generally speaking, weight loss between 5% and 10% has been found to reduce the risk of diabetes, hyperlipidemia, hypertension, and other associated cardiovascular diseases. Most weight is lost during the first three months, but because the intragastric balloon stays in your stomach for six months, you will learn to eat the right amount of food to maintain your new weight long-term. This balloon is not permanent. You will visit the doctor in six months to have it extracted via endoscopic procedure (same way it went in). If during those six months of having the gastric balloon in place you did NOT change your lifestyle and alter your diet and exercise, you won’t like what happens next: You’ll gain all that weight back in no time. This is where the Allure MedSpa Aftercare programme helps tremendously. Why should Gastric Balloon be preferred over other Types of Surgery?